Look at you, rockin' another vlog. I'm waiting for my sushi to arrive - yum - and saw your post come through. what a cute VLOG! Thanks for stopping by my doublewide and good luck as you promote the drug biz! So, does this job make you a ... pusher? Have a great weekend! Great vlog. And btw, I feel the same way about some of my old blog posts. FOr two years I had virtually zero followers and felt like I wrote some great stuff that got ignored. I should repost. That is a great idea. What a sweet message! I liked the way you clarified which drugs New Jersey is known for! Such a cutie you are! I just haven't been brave enough, besides you younguns look much better on the video than those of us with a few wrinkles. Love that you've written for everything from Hondas to cheese. Pretty wide compass, there. It's so nice that you do this. Seems like you're in my living room with me vs across the frickin country in the land of drugs. :) I wish I was savvy enough for vlogging. PS CONGRATULATIONS ON the job, even though it's stressful given the learning curve. You'll make it work! Thanks guys! Remember this is just a freelance gig though - it could end any time next week. So neat to put a face/voice to a blog. :) You rock, woman. I like the shades! Remember, when you are cool, the sun never goes down. Wow! Congrats on the pharma gig. About time they pay a talented writer such as yourself. BTW...you should do the vlog more often. Do like a viewer mail thing or something. I think the camera (and us bloggers) like you. Again congrats! You are so cute! You almost look younger than your school age pic, ha! Congrats on the job & I hope it gets easier as you go along. Joe - sunglasses were on because it was like 2ish when I recorded that. Ha ha! 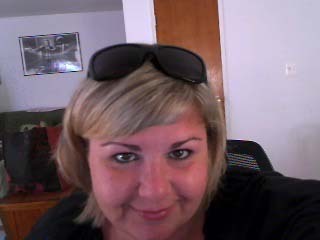 We were about to head out to a party and it was sunny outside :) I "ain't no" sunglasses at night Corey Hart chick! Ha ha! Copyboy, shall I call you coyboy from now on? OMG. I just wanted to comment on that awesome photo on the wall behind you! Pulp Fiction baby!!! Woo hoo! Another vlog! I was watching this video thinking to myself.... 'Oh no! Her husband is missing!'.... Are the vlogs easier to do? You're so dang cute! I love your vlogs!